A haven for both healthy choices and cheat meals, Sardi in Hawthorn is open early til 4pm every day. 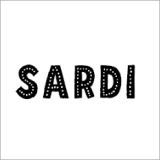 Due to the popular demand of their new healthy vegan and vegetarian menu, Sardi has recently renovated to allow for more seating space! Their fresh new menu features smashed avo, a smoothie bowl, a brekkie board, hotcakes, sweet potato fries, a burger AND tacos. Now you know what all the fuss is about. Afterwards, refresh with a milkshake... Sardi offers the classic flavours plus matcha, oreo, malteser and mint chocolate. If you’re being good, you could also swap it for a smoothie or kombucha, but they’ll keep the secret if you decide to cave for the malteaster milkshake! Sardi’s crisp white storefront, combined with their bold black logo practically calls you over. There’s no way you can walk past Sardi without feeling at least a little regret. Step through the doors and you’ll be glad you did. Sardi’s interior is simple, sleek and stylish- featuring hanging cage lighting and pops of colour. Check out the walls! See anything you like? All of the vibrant artwork on display is for sale (and made by local artists), so you could leave Sardi with more than just a full belly and satisfied tastebuds.